Nov. 27, 2018 — PACIFIC OCEAN (NNS) — Sailors aboard Arleigh Burke-class destroyer USS Wayne E. Meyer (DDG 108) conducted a fisheries patrol exercise with the U.S. Coast Guard and Ecuadorian naval assets in the Pacific Ocean, Nov. 22. 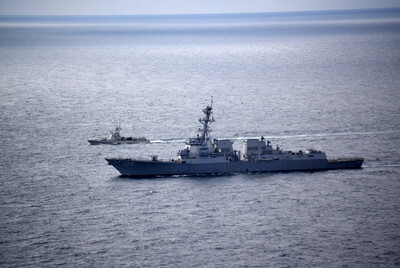 The ship, along with embarked personnel of the U.S. Coast Guard Law Enforcement Detachment (LEDET) from the Pacific Tactical Law Enforcement Team and a P-8A Poseidon from Patrol Squadron (VP) 16, coordinated with Ecuadorian navy assets to conduct a counter illegal, unregulated and unreported (IUU) fishing exercise. The purpose of the exercise is to build proficiencies in detecting and deterring IUU fishing in the USSOUTHCOM area of responsibility and to support internationally recognized fisheries laws and the suppression of illicit activities. The range and versatility of U.S. Navy assets allow the embarked U.S. Coast LEDET and partner nations to quickly identify and respond to illicit maritime activities. The guided-missile destroyer is operated by more than 300 crew members and is based out of San Diego. USS Wayne E. Meyer is part of Littoral Combat Group One, which is deployed in support of the Enduring Promise Initiative to reaffirm U.S. Southern Command’s longstanding commitment to the nations of the Western Hemisphere. Sailors aboard Arleigh Burke-class destroyer USS Wayne E. Meyer (DDG 108) conducted a fisheries patrol exercise with the U.S. Coast Guard and Ecuadorian naval assets in the Pacific Ocean, Nov. 22. The ship, along with embarked personnel of the U.S. Coast Guard Law Enforcement Detachment (LEDET) from the Pacific Tactical Law Enforcement Team and a P-8A Poseidon from Patrol Squadron (VP) 16, coordinated with Ecuadorian navy assets to conduct the counter illegal, unregulated and unreported (IUU) fishing exercise.